For the municipal district, see Cardston County. For the provincial electoral district, see Cardston (provincial electoral district). Cardston is a town in southwest Alberta, Canada. Cardston was settled in 1887 by members of The Church of Jesus Christ of Latter-day Saints (Mormons) from Utah Territory who travelled via the Macleod-Benton Trail to Alberta in one of the century's last wagon migrations. They had departed April 6 and arrived June 3. The official founder of the town is Charles Ora Card, after whom the town is named. The combined church and school was completed by January 29 the following year after their arrival. Cardston is situated in the low foothills of southwest Alberta, approximately 25 km (15.53 mi) north from the American state of Montana. On its north side, it borders the Kainai Nation (Blood Tribe) Indian Reservation, one of the largest reserves in North America. 40 km (24.85 mi) to the west of Cardston are the Rocky Mountains of Waterton Lakes National Park. Cardston is 77 km (47.85 mi) southwest of Lethbridge and 234 km (145.40 mi) south of Calgary. In the 2016 Census of Population conducted by Statistics Canada, the Town of Cardston recorded a population of 3,585 living in 1,175 of its 1,270 total private dwellings, a 0.1% change from its 2011 population of 3,580. With a land area of 8.59 km2 (3.32 sq mi), it had a population density of 417.3/km2 (1,081/sq mi) in 2016. In the 2011 Census, the Town of Cardston had a population of 3,580 living in 1,208 of its 1,322 total dwellings, a 3.7% change from its 2006 population of 3,452. With a land area of 8.64 km2 (3.34 sq mi), it had a population density of 414.4/km2 (1,073/sq mi) in 2011. The population of the Town of Cardston according to its 2007 municipal census is 3,578. Cardston experiences a humid continental climate (Köppen climate classification Dfb). Along with the rest of southern Alberta, Cardston is subject to chinooks, which often bring temperatures in mid-winter well above 10 °C (50 °F). This same pattern results in more than 200 days of wind a year. Cardston has a soccer park, ball parks, a golf course, an ice skating rink, a swimming pool, tennis courts, hiking trails, a skateboard park, several recreation parks, picnic areas and playgrounds. The local schools and LDS Church buildings have gymnasiums. St. Mary's Dam reservoir northeast of Cardston supports water sports in the summer months. 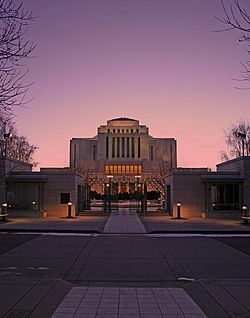 The Cardston Alberta Temple is one of southern Alberta’s most recognized landmarks. It was constructed by Mormon pioneers who settled Cardston in 1887. The temple became the centerpiece of the town, and it was the first temple constructed by the church outside of the United States. The Remington Carriage Museum houses the largest collection of horse-drawn vehicles in North America, with more than 250 carriages, wagons and sleighs. The 63,000-square-foot (5,900 m2) facility features video displays, a fire hall, carriage factory, restoration shop, working stable, carriage rides, carriage rentals, a restaurant, and a gift shop. Guided tours are offered for free. On April 9, 2006, the museum was briefly mentioned on TV in Canada as a destination of Patty and Selma's vacation during the Kiss Kiss, Bang Bangalore episode of The Simpsons. This theatre was constructed in 1912 by Mark Spencer, and underwent renovations in 1937 and 1992. It seats 350 and hosts films, community theatre and professional summer theatre, which has produced such shows as Seussical, Oklahoma, and Joseph and the Amazing Technicolor Dreamcoat. A genuine "Little House on the Prairie", it was built by Cardston’s founder Charles Ora Card in 1887, and served as a community centre and stopping place for travellers until the first hotel was built in 1894. The log structure stands in its original location and is open for public visits as a Registered Provincial Historic site. Waterton Lakes National Park is a national park in the southwest corner of Alberta, 40 km (25 mi) west of Cardston, and borders Glacier National Park in Montana, USA. Waterton Lakes was Canada's fourth national park, formed in 1895. Amid the peaks are the lakes of Waterton Lakes National Park, carved out of the rock by glaciers. On April 29, 1903, at 4:10 a.m., the mining town of Frank, Alberta, was devastated by 82 million tonnes of limestone crashing down from Turtle Mountain. The Frank Slide Interpretative Centre in the Crowsnest Pass, 130 km (81 mi) northwest of Cardston, tells of one of the geatest natural disasters in Canadian history. Castle Mountain Resort 90 km (56 mi) west of Cardston has kilometres of groomed skiing runs, natural half pipes, deep fresh powder, short lift lines and wide open spaces. Writing-on-Stone Provincial Park, 125 km (78 mi) east of Cardston, is one of the largest areas of protected prairie in the Alberta park system, a nature preserve and protection for rock art created by Plains People. There are 50 rock art sites, with thousands of figures, as well as archaeological sites. Police Outpost Provincial Park is 32 kilometres (20 mi) south of Cardston, on the Canada/United States border, on the shores of Outpost Lake. Cardston Facts for Kids. Kiddle Encyclopedia.